Architectural works of art are of particular interest to modern interior designers providing them with interesting and often unique artefacts to weave into their house designs. 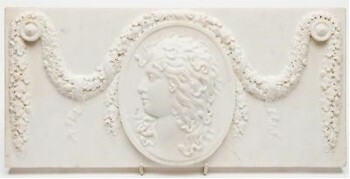 A Carved Marble Plaque (FS26/845), which realised £1,250 in April 2015. The category covers a wide range of interior items such as fireplaces, carved marble panels (many of which are copies of classic Greek friezes such as the famous Elgin marbles) and doors. It also covers outdoor furniture and statuary such as cast iron street lamps, gates, stone pillars, granite plant troughs and garden statues. The category also includes stained glass with examples by Morris & Co and Sir Edward Burne-Jones (1833-1898) in particular being highly prized. Coalbrookdale Cast Iron was used extensively for outdoor furniture and statues while Coad Stone (or Lithodipyra), which is often described as reconstitued stone, was frequently used for high quality Neoclassical statues, architectural decorations and garden ornaments that were very weather resistant as well as ornamental keystones in 18th and 19th century buildings. Architectual pieces in the Inigo Jones style used in French and Italianate garden designs are also popular at auction. 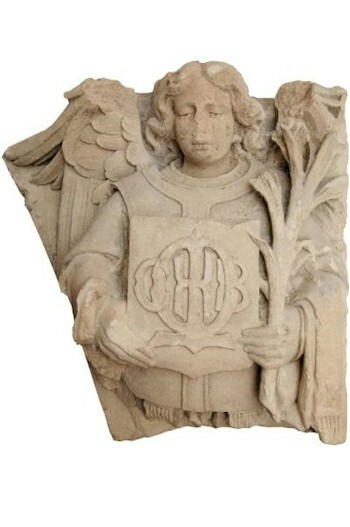 A Carved Limestone Bust of an Angel Holding a Palm Leaf in Her Left Hand and a Shield in the Other (FS22/792).